Happy Easter everyone!!! Hope everyone is having a great day!! I'm woooorn out- Dita's show was beyond incredible last night! It's incredible, when she is on stage, you don't see any of the other dancers, its nearly impossible to tear your eyes from her, she is stunning! She did this smoke dance/act that was beyond words. The rest of the acts that she wasn't in that were just part of the normal Crazy Horse show were incredible too!! They do a soldier routine at the beginning that is absolutely NUTS. The show is definitely worth a look- with or without Dita- but Dita's acts were awesssssooome. Or to those that know me personally... AWE5OME. :-P Today's nails are (obviously) Easter inspired.... baby chicks!! So jealous that you got to see Dita - she is soooooo gorgeous! And oh yeah - cute nails! LOL these are super cute! I love the way Dita dresses for everyday... the fabulous late 1940's-early 1950's vibe/thang she's got goin' on. 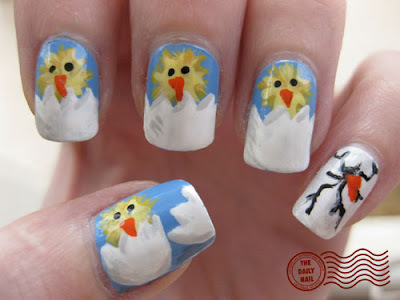 And I love the little chicks on this mani- what great faces! They look like that fancy kind of chicken- I don't know what they're called, but I think Ms. Martha Stewart probably has a flock of 'em. But they're super fluffy looking, just like your chickies. Where did you get your Orly Snowcone?? Its ADORABLE and I can't find it anywhere!!! Not even Sally Beauty or Ulta!!! Olivia if you cant find Orly Snowcone then Barry M do a colour which is almost the same. Its Cyan Blue and the code is np294. I wanna see Dita's performance so bad!! Love the pinky finger, soooo cute! whats on the pinky finger? Awesome nails. Very original. I love Dita too.